Farmhouse Bread – Possibly the EASIEST Bread You’ll Ever Make ! ++ UPDATE My fellow blogger friend John, who I mention below, recently made one loaf of ‘Farmhouse Bread’. He was very pleased with the results – in spite of the fact he forgot the dough rising in the oven… for 4 hours! I recently read bloggers should not begin a post by apologizing for having been out-of-touch.. that is.. unless you’ve been doing something noteworthy, such as vacationing. So, I’ll use that as my excuse because I did just return from a trip to Mexico. I spent a week at Sandos Playacar Beach Resort in Playacar Del Carmen, Mexico, and it was all-inclusive and totally wonderful. I baked these loaves and took the photos before I left, planning to post the recipe while in Mexico….but I left the recipe at home… Liz, who writes the excellent food blog ‘My Favorite Pastime‘, wrote to me (after I whined to her how I’d forgotten the recipe), “Have a great time. You can always post the recipe once you get home”. And John, ‘From the Bartolini Kitchens‘, told me, “You’ll find the recipe when you least expect it”. It turns out they were both right & I thank them for their words of wisdom. So – without further ado – here’s the recipe for ‘Farmhouse Bread‘, which makes two beautiful loaves quicker than any bread recipe I’ve ever seen simply because you don’t have to wait for the bread to rise twice! ** If you have any questions or comments, keep scrolling down. I love to hear from you !! 2 cups warm water ++ The water should not be over 110F. 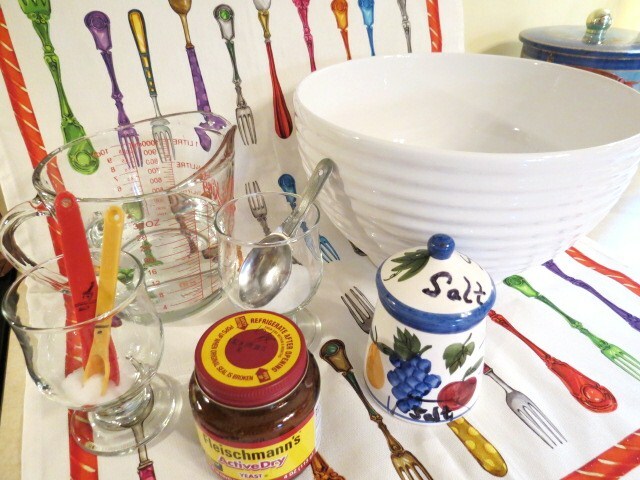 ++ Heat up your measuring cup first by running hot water over it, then fill it with warm water ++ Check the water temperature by pouring a bit on your wrist – it should feel slightly warm. 5 1/2 to 6 cups All-Purpose Flour ++ Some bread recipes in the States ask for ‘Bread Flour’.. but not this particular recipe. Cornmeal, to spread on bottom of a cookie sheet – OR – use parchment paper, which I prefer. In a large bowl mix together 1 Tbs. active dry yeast, 1 Tbs. sugar, 1 Tbs. salt and 2 cups warm water. Allow mixture to stand 4 – 5 minutes while the yeast ‘eats up the sugar’, the combination of which will make the bread rise! 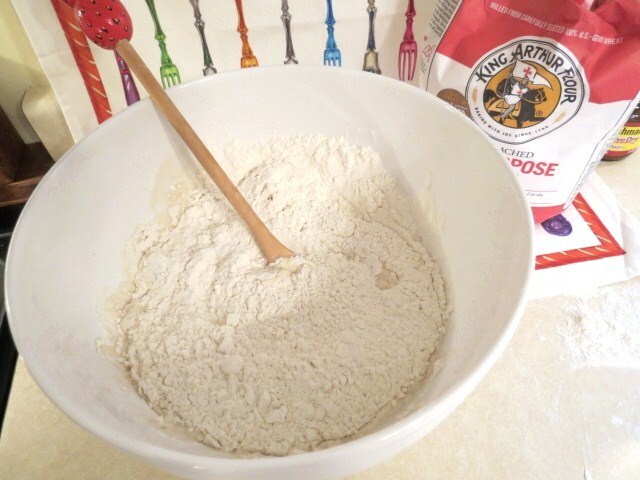 Gradually add the flour to the liquid and mix thoroughly until the dough pulls away from the sides of the bowl. ++ Making bread is not an exact science. One time you may need a bit more flour and another time you may need a bit less. I ended up adding a bit more warm water because my dough was too dry and some of the flour wouldn’t incorporate into the dough. Don’t be afraid to ‘play around’ until the dough just feels right. You can always add a bit more flour when you’re kneading the dough. ++ I like to use a floured dish towel. (Tea towel for our British friends!) Knead dough 5 minutes. 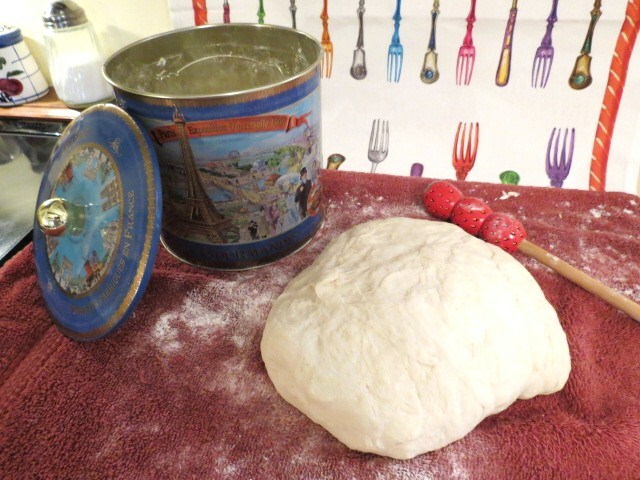 ++ To knead dough, push away from you with the palm of your hand, turn dough, fold over and repeat. If dough is too sticky, add a bit more flour. If it’s still sticking to the floured surface.. yup.. add a bit more flour. 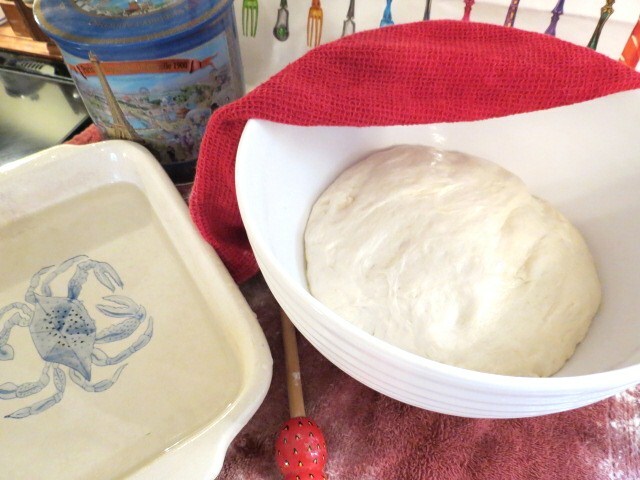 Let the dough rest while you wash & dry the bowl. Using your hands, spread some oil (I use olive oil) around the inside of the bowl. Knead dough again for 2 to 3 minutes. 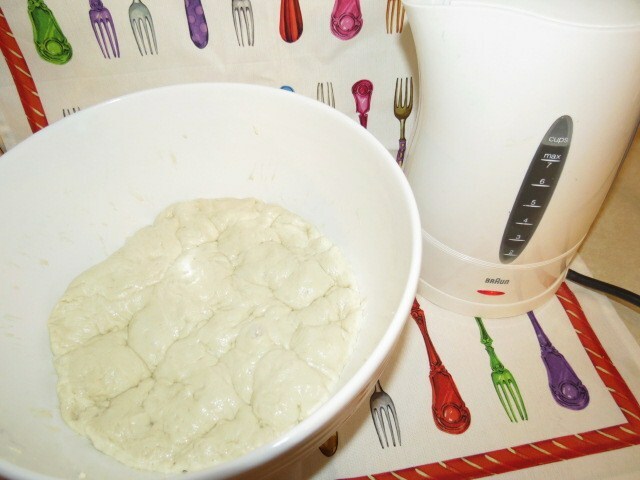 Place dough in the oiled bowl and turn dough over once to oil the top. 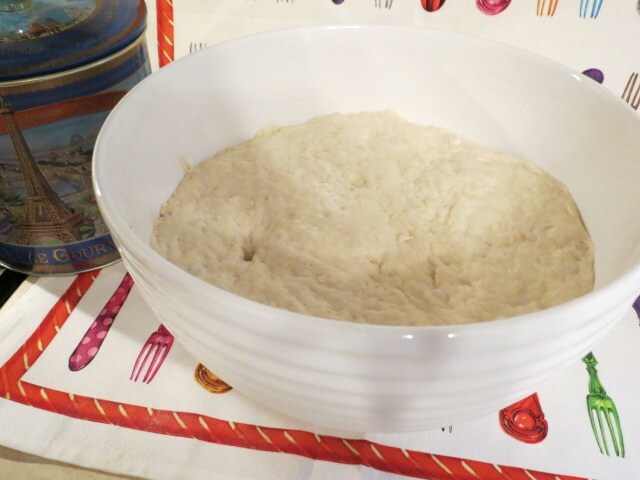 Cover bowl with a damp towel and keep warm until dough doubles in size – between 1 – 2 hours. SEE TIP BELOW !! Cut dough in half using either a knife or kitchen shears. You don’t have to be overly fussy with it. Just try to end up with two pieces of dough pretty much the same size. Form each half into Italian or French styles loaves. I went for a more rustic Italian look – if you’d like the same look, form dough into two 8″ – 9″ loaves. Place the loaves on a cookie sheet generously sprinkled with cornmeal OR use parchment paper, which I prefer. Allow loaves to rest 5 minutes. ++ If the cookie sheet is lined with parchment paper, you can form the loaves right on the cookie sheet – which is what I do. Slash the tops 3 or 4 times diagonally. Brush loaves with cold water. ++ I sprinkled my loaves with sesame seeds but it’s not necessary. Shaped, Slashed and Ready to Rise ‘n Bake. As you can see, the dough has already risen quite a bit since I formed it into loaves! This is the coolest thing I’ve ever seen in bread making. You don’t have to wait for a 2nd rising. Your loaves are going to rise in the oven! Place the cookie sheet containing the loaves into a COLD OVEN!! Refill the baking pan you’d use before with BOILING WATER and return it to the bottom rack of the oven. ++ Caution – – don’t fill the baking pan too full with boiling water. The water’s going to slosh around a lot and you could get burned ! Place shaped loaves on the center rack of your oven – then set temperature to 400F. ++ As your loaves are rising, don’t be alarmed if they get so big the sides touch. That happened to me, so I just broke them apart after they cooled a bit. Bake bread for 35 to 45 minutes, until the crust is golden brown and the bread sounds hollow to the touch. Remove loaves from baking sheet and allow to cool.. not for long… just until it’s cooled enough so you can hold on to the bread while you cut a nice, big piece and slather it with butter. Enjoy! P.S. My neighbor said this is the best bread she’s ever eaten! Of course, she might’ve just said that so I keep coming over with ‘goodies’!! ** Adapted from King Arthur Flour’s – “Hearth Bread”. King Arthur Flour’s ‘Flagship Campus’, as they call it, is located in Norwich, Vermont. It’s a wonderful place to visit, so drop by if you’re ever in the area! You should have mailed me a few slices of this beautiful and well risen bread. I love fresh bread. I probably would have finished half a loaf by myself. I think your neighbour meant what she said. Plus I’ve learnt a new thing about skipping the second rising. I shall certainly try that one of these fine days! Have a blessed weekend. Hi Grace – I’m so glad you enjoyed my latest post & I really believe you and your husband will not only love this bread – but you’ll love how quickly it comes together. Thanks so much for checking out ‘My Yellow Farmhouse’ – I hope you come back again!! P.S. – I just saw that you’re now following ‘My Yellow Farmhouse’ – which I great! Let me know if there are any particular types of recipes you’d like to see. I’m planning on, during the next few weeks, posting recipes which people can prepare ahead of time to make their Thanksgiving Day meal a bit easier. 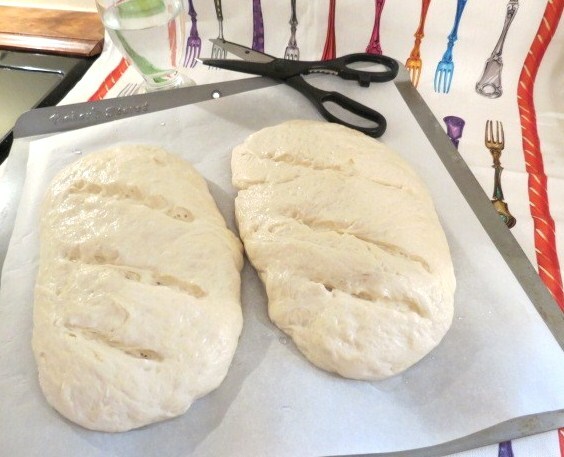 I just visited your blog for the first time and this photo of bread was what greeted me. I just finished lunch and the bread looks so yummy it makes me hungry all over again. I love the way your walk through the step-by-step instructions. My husband and I love bread with our meals, so this goes on the list of recipes to try. Now I understand why you wanted to find this recipe. Your loaves look wonderful, Cecile! I will definitely give this a go, probably the next time I’m in a bread making mood. I’ll probably cut the amounts in half, though. A 3-cup loaf of bread is usually perfect for me, with little, if any, going to waste. How very sweet Ms. Boleyn ! Thanks for commenting !! Your lovely golden loaves of bread would be a treat on any farmhouse or city apartment table.